Two young ladies set out to demonstrate that the stone sculptures of world famous Tudor artist Willam Jenns, Tilebury's most famous son, was actually the work of his overlooked wife Elisabett. In less enlightened times Elisabett's talents were unacceptable to the male dominated community and she was accused of witchcraft. In the intervening years male historians had not seen fit to correct her reputation. As the women begin to collect the evidence, however, it appears that Elisabett's story was not after all so straight forward. Disturbing and contradictory information begins to build up and the villagers begin to act strangely. As they find out more about Elisabett, the visitors are drawn into events half a millenium ago which may not, in fact, have been fully resolved. Elisabett of Teilburry. A Story of Witches. 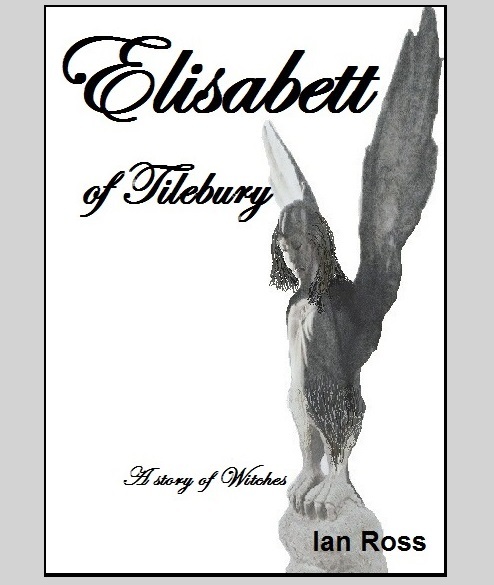 "So, Elisabett of Teilbury or Lizbet of Tielberry or Telburry or other variations like that, was this amazing Tudor-era stone-carver..."
"Was she? I thought that was what you're trying out to find out? Whether she was a stone carver or not, I mean." "Oh no - I've always known that. The truth is pretty obvious when you look at it. It's just that in this dissertation they want to see evidence and research and so on, so it's all about pulling things together - patching up all the evidence and proving it. It's the same story - you know, men are the ones who write the records -the priests and monks and so on - and no-one wants to give credit for anything to a woman in case their wives get ideas. Nothing ever changes eh? Which is why it's so important to re-write the history so women's roles can be held up as more than mere baby-machines - even in the middle ages. "But still, it's all fine and I don't mind because I need more content for my dissertation, so there's no big issues about getting on the train and going down there - kind of fieldtrip really. Out in the styx you know - do you think they'll have TV? But anyway, Miss Annabel, stop interrupting - you said you wanted the background so..."
"...so - Elisabett, yes - most of the stuff I've read comes from the history of Friar Assa who was chucked out of Bardsey Monastery when Henry was dissolving the monasteries and stuff. After that he seems to have given up on religion and gone wandering through Wales and western England sticking his nose in, getting drunk, having fights and writing a kind of journal of his progress. Anyway, I got hold of a translation of a section he wrote when he passed through Tilebury in around 1570. That's about six years after they drowned Elisabett as a witch. It seems he made enquiries into Elisabett's story from people who knew her and wrote some of it down. "His version assumes both that she was a witch - which is exactly what a man like him would think of any woman who had no children and spent her time doing something like stonework - and that she either carved the stone my magic or cast spells on men around her who carved the stone at her command. His main purpose seems to have been to find out which one it was because as he says, and I really love this phrase, 'It is a thing most seminal to know whether and towixt what end the witchly arts may be made to play upon a weak and ignorant mind - be it of man or woman, or whether those powers cease at the boundaries of the abomination's own corporeal...' somethings - meaning whether witches could only do magic themselves or whether they could also control other people. "Anyway, after making some reference to having heard of Elisabett years before and having spoken to her husband in Gloucester after the couple had split up - which must have been before 1560 because that was when he died - Assa rambles on about the people he spoke to and how scared they still were of her - even after her death." "What kind of stuff did she do? Go on - let's have the gory details." "Well Assa doesn't seem to have many actual details because the villagers were reticent because they were still scared of her and didn't necessary think she was dead. Nonetheless, there's the usual things about strange noises at night and farm animals going missing and a whole family at one point get's poisoned - probably just botulism in the family stew, in my view. Then there's a few more specific things like she is said to 'have stared and with the evil eye caused Samuel Millman a fine labourer of good stock and body to writhe and squirm upon the cobbles of the cheap in full view and alarum of the people therein stood until afterwards he was never able again to walk and must needs crawl upon his hands until the moment of her death when he did spring up and resume his former way.' Which is quite a good one and of course rather hard to disprove since Mr Millman would by then have been entirely normal again. And there is also something she is said to have done to the wife of a farmer which 'did strike her dead upon the place instantly'. Like maybe she had a heart attack. "And of course, because everybody's trying to make a point about her being a witch, there's stories about things happening after her death - like people hearing her voice in the church and a plague of toads and some local girls going mad - by which they probably mean just sneaking off to smoke cigarettes and eat chocolate in the hay-loft when they are supposed to be washing dishes or something. Drake had discovered coffee and chocolate and tobacco and things in America by then hadn't he? "Of course everything he says is explained in terms of witchcraft so it is quite hard to get any real facts out of him. However, trying to piece things together, my version of Assa's story is that she was born in a place called Colslade in Crickellie and named after the new princess Elizabeth who had been born a couple of months before. That makes it late 1533. Her mother dies in childbirth - cue a rant about all sorts of foul demonic omens rather than any comments on the incompetence of male doctors. Then, some years later her father, an 'unskilled labourer quarrying in the Coteswold,' gets mixed up with a local gentleman and is hanged for something called scandala magnata. This leaves Elisabett, barely more than a child, fleeing through the countryside until she winds up in Tilebury, which is a smallish town by the standards of the time. "There she seems to have met up with and 'perchance brought under her spell' a young labourer named Willam or Willum Jenns - who you may have heard of..."
"He's the guy credited with all the carvings right? Her husband." "Yes - but more about him in a minute. At this point he is just the village idiot. Typically, within about three minutes of arrival the locals decide that as a young single woman she needs a husband otherwise: Scandal! No doubt very magnata. So they force her into marrying Willam who suddenly discovers an interest in stone-masonry. Much scratching of heads as this guy has never shown any aptitude for such things before, but never mind - there's work to be done on the new church - Anglican I think, but Assa sometimes calls it Catholic and generally can't mention it without making all sorts of bitter comments about the devil and ungodliness and how it is entirely appropriate that its finest carvings were made with the use of satanic powers. But I digress. "So with a new zeal and dedication Willam is churning out morticed corners and fluted pilasters and what-not and everyone is suitably impressed although they think his wife is a bit dodgy apparently - which I suspect is hindsight. And then, even more amazingly, one morning he trots down to the building site carrying a fully carved column capital - that's the bit at the top directly under the ceiling - with flowers and meadow grasses from which a face is peeking out with a single teardrop falling from one eye. The thing is apparently wonderous to behold and clearly the work of a master mason. "So no-one believes poor Willum when he says he carved it himself. How could he? Everyone has seen him at work every day for the last year - when did he have the time? And anyway - his block-cutting is okay but he's never done any carvings before. There's no intermediate work you see - he just suddenly appears as a fully fledged grand master. "So they gather round and threaten him and demand to know where he has stolen it from until in the middle of the row his wife Elisabett suddenly appears. Typically, at this point just when things are getting dramatic, Assa gets himself distracted and goes off on one about Elisabett and how no-one can agree what she looks like. Some people tell him she was really beautiful and some say she was downright ugly. She is variously tiny like a faerie - that's F A E R I E, the evil kind - and huge muscular and hunchbacked like a bear. Sometimes she is red headed like the queen and sometimes has matted black hair like that bear we mentioned a minute ago. The only things everyone can agree on is that she had a 'wounded hand, as if from which a piece had been taken, or rather bitten away,' and that there was something screwy about one of her eyes. Anyway, once again typical of a man that the only real interest he takes in her is to assess how attractive she was. "Back to the story - Elisabett appears and either she takes over and does the talking on behalf of her husband or 'her very presence did cause in him the effect of sudden loquaciousness and he did without expectation speak fine and compelling words of a sort which he was not normally wont to utter.' Basically either he or she promises that he will prove his abilities by carving another capital into whatever shape the vicar should choose. The vicar chooses a biblical scene of Jesus in the wilderness denying temptation and they escape before the mob lynches anyone. "Well the carved capital duly turns up and it is amazing. There is Jesus and a little winged devil with a single teardrop coming from one eye and some stones which look like loaves and a panorama of the kingdoms of the world and the pinnacle of the temple with some Angels hovering around to catch Jesus if he jumps. All very impressive. Willam is hailed as a genius and sets about making capitals and other decorative bits for the rest of the church which he churns out at an incredible rate. "Or does he? Assa gets all wound up about whether Willam is carving these things under Elisabett's spell or whether in fact she is carving them herself and giving them to him. No-one can tell him for sure. However, he makes a few points. Firstly, no-one has ever seen Willam carve anything. Secondly, after he stops working on site he is commonly seen in the local Inn and helping on his parents' farm and yet the carvings come thick and fast at a rate no other mason could manage. Thirdly Assa recalls that when they met in Gloucester Willam's hands were covered in wounds and scars caused by shards of stone and the slipping of sharp chisels. Everyone he speaks to, however, remembers that at this time when he was in Tilebury, Willam had soft unblemished hands. "Which reminds Assa about Willam going to Gloucester. No-one quite wants to tell him why Willam left Tilebury - although it is clear that someone spotted something in one of his carvings which led to a public rumpus. The mob got angry about whatever it was, so Willam fled before he was pulverised. Assa pushes but no-one will say anything about what exactly it was that the citizens of Tilebury had seen in the carving and got so annoyed about. Finally Assa bribes an old blind beggar with hot food for a week and is told to look to what has been removed from the carving of Gethsemane. "Assa runs off to the church and finds a frieze or something behind some altar and sure enough there are the apostles and some Roman soldiers and there is Judas with a single tear coming from one eye and a bag of gold and Jesus in the foreground blessing him with a raised right hand but no left hand. The left hand has been chipped away entirely. Well clearly this is no answer. So Assa goes around and sees some of the other carvings and some of them also have hands removed. So he goes back to find the beggar to demand an explanation only to find him sitting precisely where he had been - completely dead and staring into the void with a look of total terror on his face." "I bet that must have freaked out old Assa." "Absolutely. He runs for the hills and his next entries are from Cadbury fort." "So what happened to old Betty when her husband went to Gloucester?" "Assa doesn't mention that, but there's this local history book I found in the library which says that she was drowned in the village pond on a ducking stool in 1564 and describes her at the time of her death as a wealthy widow-lady and owner of a mason's yard. So I'm assuming she took over the business. Or maybe just continued running it without Willam. Certainly, there were loads of carvings made after Willam left Tilebury. This is where you get into the architecture books. "You see Willam Jenns is famous in medieval architectural terms. It is not just the Tilebury church - in fact that is barely ever mentioned in the books I've looked at. During that purple patch between the first carvings at Tilebury around 1548 and his being run out of town for something to do with the left hand of Jesus around 1557, his fame spread all over southern England. He seems to have been in real demand for at least a decade and his work was incorporated into buildings from the custom-house at Plymouth to the Mayor's palace in Casterbridge. Oddly, other than Tilebury church he doesn't seem to have produced anything for any other religious buildings. Most of his work is friezes and floral borders and so on for showy public buildings commissioned by great men who wanted to prove they'd bought the best. "However, it is pretty obvious when you think about it that it wasn't his work at all. You just have to look at the dates. The actual date on which lots of the work was completed is hard to verify but some of it was definitely both commissioned and delivered after he'd died in 1560. Architectural historians tend to refer to this as "School of Jenns" by which they mean the work of apprentices and junior masons in the yard which Elisabett continued to run in Tilebury. However, they tend to agree that the standard of that work was as good as, if not better than, original Jenns work from the 1550s. "Also, it is clear that Jenns himself did continue to produce carvings after he fled Tilebury. There are records of him appearing in Gloucester in around 1557 and keeping at it until he drank himself to death in around 1560. However, there are only a couple of pieces of his work from this period still in existence and by all accounts they are complete rubbish. The historians tend to say that he had some kind of breakdown or was suffering from some nervous disease which took away his skill with the chisel. The obvious answer, however, is that he was never much of a mason or an artist in the first place. In fact he was just cover for Elisabett in Tilebury and when he left he didn't have the skills to do the work on his own. She by contrast continued happily without him until they murdered her in the ducking pond. So who do you think the actual skilled stone-carver was? "Which is why I need to set the story straight. All the modern historians and carving specialists are men and they just want to preserve the existing story so it's nice and comfortable and involves another middle ages male artisan who produced stuff we can still say is brilliant. So they come up with any apology to make it sound like that man was responsible for the work and to prevent anyone being told the truth about this exceptional woman who actually deserves the credit for her own genius." "Sock it to them, sister! Sounds pretty good. So are you going down there to check it out?" "Yes, train this afternoon to Swindon, change and then taxi to Tilebury. I'll have to practice my rustic accents. Arr! Apparently the church has been converted into a kind of village hall and I got in touch with some lady who runs the community group, Cate Paddock, who is going to let me in tomorrow."